Duerrs sent me some blackcurrant jam to try in a recipe, either sweet or savoury. I love using my slow cooker during winter, nothing beats throwing a load of ingredients into a pot and leaving it until tea time so you have the day free and the house smells of delicious home cooking. 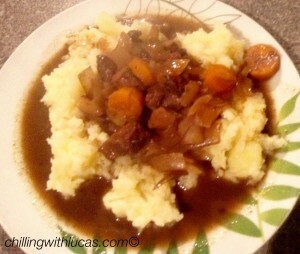 I decided to adapt Duerrs Fruity Beef Casserole for the slow cooker. I also changed the quantities for 2 adult servings. This looks and sounds so yummy, the perfect winter warmer, real comfort food. I LOVE my slow cooker. I especially love recipes where all you have to do is chuck it in. I’m pinning this and I’m going to try it this week. Thanks. I’ve just got a new slow cooker after yrs without. Why did I leave it so long! !